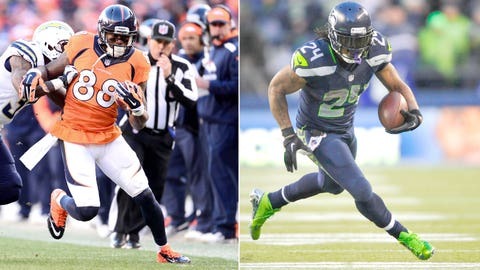 Receiver Demaryius Thomas (left -- four TDs in his last three games) and tailback Marshawn Lynch (143 yards, two TDs last week) are viable bets to lead their respective positions on Championship Sunday. Here are my positional rankings for Championship Sunday, covering quarterbacks, running backs, wide receivers and tight ends for standard-scoring leagues (non- PPR). To view the "5-Minute Guide For Surviving NFL-Postseason Fantasy Leagues," click here.